Marcus Bontempelli probably won’t win the Brownlow Medal this year. After Round 13, he’s the equal tenth favourite on the betting markets, a $41 long shot. But for a 20 year old to be among the top ten favourites for the Brownlow is an achievement in itself. If he keeps improving along his current trajectory, he’ll be seriously challenging for a Brownlow before too long. 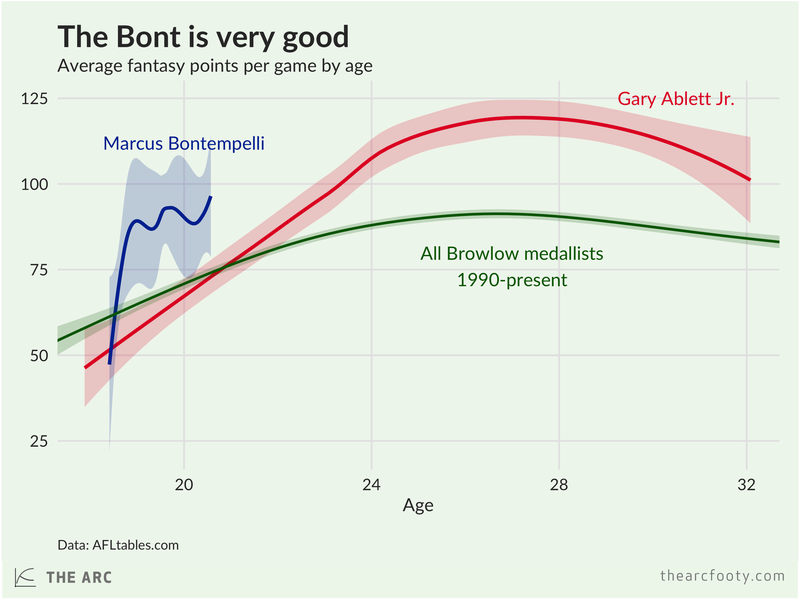 So far this year, Bontempelli has averaged 90.1 Fantasy points, that imperfect but still informative summary statistic. 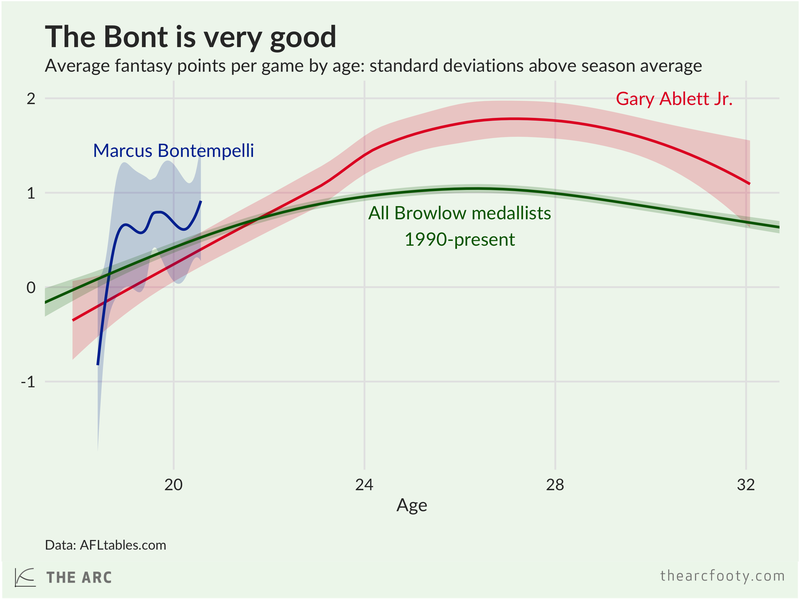 To put that in perspective, Gary Ablett Jr. averaged 69.4 points a year when he was 20 years old, while Chris Judd averaged 85.8. The comparison above is a little unfair to Ablett and the other Brownlow medallists, because the game has changed. Back in 2004, the average Fantasy score among all players was 58.7. So far in 2016, the average has been 72.1. Ablett’s 69.4 points per game was more impressive in 2004 than it would be in 2016. For a fairer comparison, we can compare each player’s score to the league average for the year. The graph below does this. A score of 0 means that the player’s average Fantasy score is equal to the league average for that year. A score of 1 means that the player’s score is one standard deviation above the league average. In 2016, the standard deviation is 26.7 points, so a score of 1 corresponds to about 98.8 Fantasy points per game. 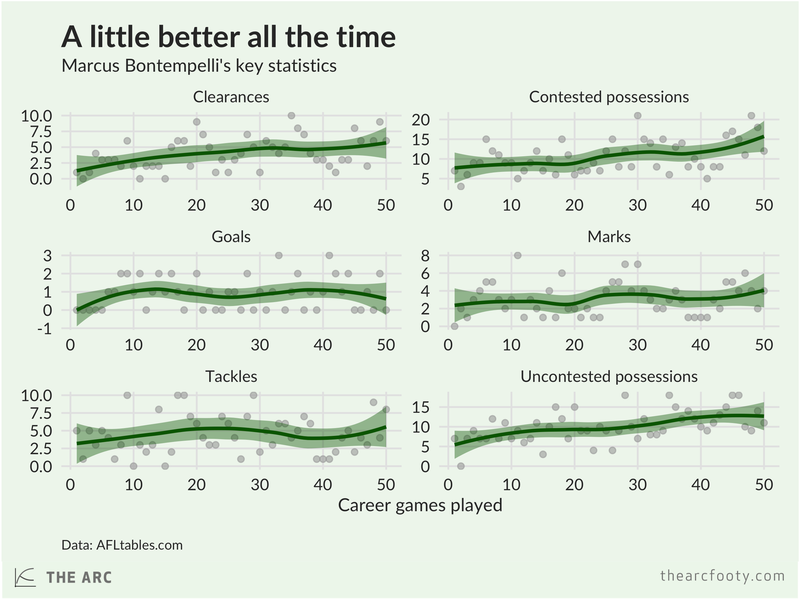 As you’d expect of a 20 year old, Bontempelli is improving steadily. He’s collecting more and more possessions, both contested and uncontested, pretty much every time he takes the field. Bulldogs fans are right to be excited about what the future holds for them with budding superstars like Bontempelli on their list.